Last night's U.K. Games Media Awards were sabotaged by flying condoms, drunkenness, physical and verbal intimidation and more - all thanks to the event's primary sponsor. Ever heard of Grainger Games? Probably not; it's a small videogame retail chain in the U.K., but it doesn't seem to be particularly well-known even in its home country. Which is precisely why it chose to sponsor the Games Media Awards held last night in London: to raise its profile with the consuming public. And Grainger's profile is certainly much higher now than it was 24 hours ago, but that's not necessarily a good thing. 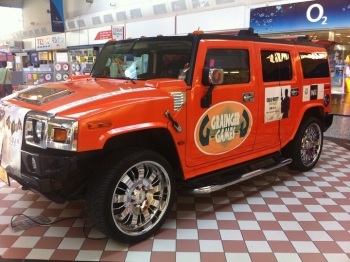 The GMAs started off with a simple ode to tastelessness in the form of a bright orange, Grainger-branded Hummer parked in front of the venue, with a pair of scantily-clad booth babes and a couple of dwarves hanging out around next to it. Once inside, guests found condoms, in similarly bright orange packages, scattered across their tables. And then things started to get ugly. Greg Davies, a comedian and actor who's apparently well-known in the U.K. [sorry, I've never heard of him] opened the festivities, but his routine was mercilessly heckled by the Grainger's Games attendees, who, as Gizmodo put it, were "pissed out of their heads." And while heckling a comedian isn't all that terribly unusual, the antics continued even as the awards were handed out. "The awards were given out by the dwarves. Speeches were uncharacteristically short, for games journalists. This was their moment in the spotlight, but no one spoke for longer than 30 seconds," according to the report. "Perhaps it was something to do with the jokers from Grainger Games, who at one point had invaded the stage to do a silly 'dance' just as someone was receiving an award." The intended highlight of the evening, a Games Media Legend Award for Colin Campbell, was also marred by slow clapping and boos during his speech. And in case that wasn't awful enough, "Several attendees at the event witnessed the Grainger Games table flick their branded condoms into other attendee's food," according to GamePolitics, while Xbox Live editor Daniel Maher tweeted that "two of them attempted to physically and verbally intimidate me after I'd told them to shut up." Later in the evening, a couple of the Grainger gang were caught by security snorting cocaine in the bathroom. Fun is fun and I'm all for a healthy dose of rowdyism, but by all reports this was an absolute train wreck. It was bad enough that Stuart Dinsey, the managing director of Intent Media, issued a statement "apologizing wholeheartedly" and banishing Grainger from future GMAs or other Intent Media events. "Grainger approached us a few months ago and explained that their intention, through association with the GMAs, was to get closer to the games media. What they have done, in spectacular fashion, is alienate the entire games media in one night. Good work, guys," he wrote on MCV. "Grainger Games' behaviour and attitude was the antithesis of what the GMAs are about. Next year we will give the event back to the media and work only with partners we know understand what the event is about." Grainger eventually responded to the uproar with an apology that came off as a little less than heartfelt. "We wholeheartedly apologize if we offended anyone at last night's GMAs," the company said in a message posted on its website. "It was never our intention to upset anybody. We sponsored the awards to show our support for everyone involved in games media and we continue to value and appreciate all their hard work and commitment." The Games Media Awards, for the record, is a fairly serious and even prestigious event. Grainger was the primary sponsor, but other sponsors included Electronic Arts, Codemasters, Ubisoft, Microsoft, Nintendo, Konami and Gamecom. Up to 350 guests, including almost 200 members of the media, were slated to attend, while "a limited number of trade tickets" were available at Â£99 - that's 160 bucks - per person. That doesn't much like a condom-flicking shindig to me.